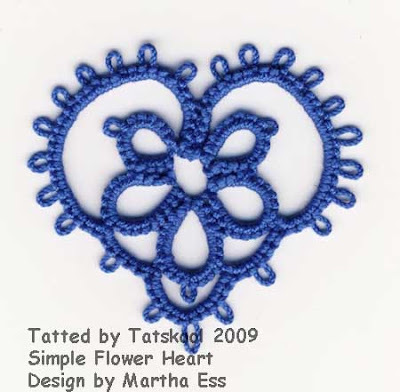 Yippee, this is the final heart that I am tatting from Martha Ess's book Tats Amore. 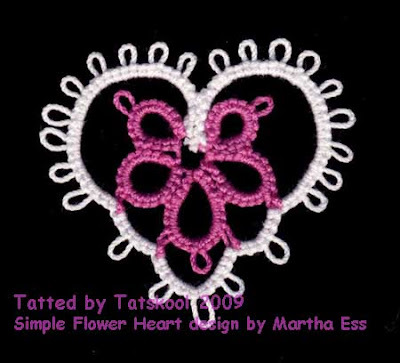 It has been a rollercoster ride of tatting from really easy beginner level hearts that look lovely....to absolutely stunning designs that I would put in the intermediate to advanced class. This final one is a stunner. 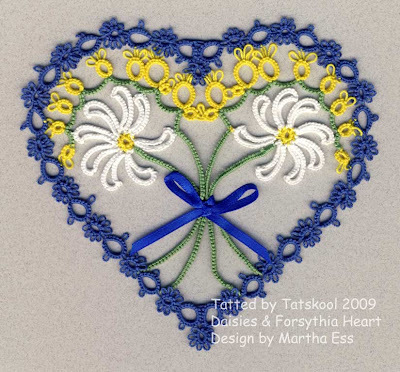 It is the Daisies and Forsythia Heart. The other tats of this heart from Martha and from Gina (who test tatted this one) have had a white outline. So I wanted to see how it would look with a coloured outline. As I progressed I was not at all sure that I liked it but the final effect I do like. I had better show it to you before I talk about it any more. 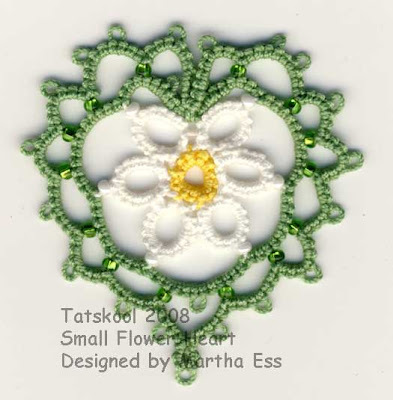 Remember the 3 daisies I had left from the previous heart ready for this one......well I obviously hadn't looked at the pattern for this one as the daisies are ever so slightly and very different!! My daisies have a picot on every petal ready for joining but there are some petals in this heart that float free withing the outline. Mmmmm I hear you say does that really matter...well this one is trying to be exhibition quality! so it does. Then I find that the petals in one go clockwise and in the other anticlockwise!! Clockwise seems to be my preference as I notice that the ones in my previous heart go in the opposite direction from Martha's one. 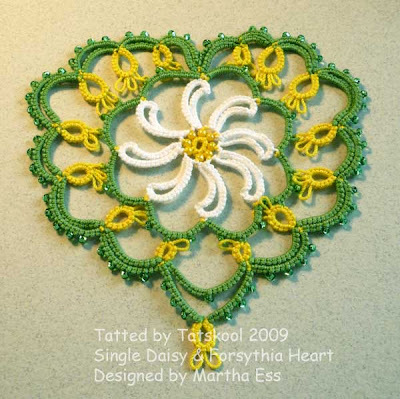 Martha gives directions for both the right and left daisies in her pattern but I find that the left one is a ...... to tat. Simply reversing the daisy doesn't work as the folded rings don't look the same on the reverse. Finally I decide to tat my daisy using wrong side stitches and I get my result. Tho' I do seem to remember that I had to do a bit of quick thinking as well!! Next comes the spray of Forsythia. That went well except for my making one teeny mistake...you can see it but I will show it to you later. Then comes the outline of little flowers. That was easy enough too. I made this heart to this point a few weeks ago and then left it till the very end. Why? you ask. because this is the bit that I hate doing...making the stems. Partly because it's very fiddly and partly because I can't do it on my knee while watching TV. If a pattern is too fiddly for this criterion, then I generally don't do it! I have to do this sitting at the table with all my concentration focused on it. I needed to get the stems going in the right direction and get the lengths and resulting curves even. That is tricky. As I tatted the first stem, the instructions said to join to the green ring of the forsythia spray. I didn't have a green ring!!! I had a yellow ring as you can see on the center of the heart. Ooops, my mistake. Once I realised this I was flying again. I even got magic threads in them. The stems look a real mess until they are blocked and you can get the whole shape right. The ribbon hides my yellow ring, so no one will ever know. So was it worth all the effort.....yes. Daisy as for previous heart. Do I like this book of Martha's....nah!! no, no don't take any notice of that....of course I do. It has such a range of interesting patterns, that I haven't seen the like of before. Now I have mastered them all, it's like completing a complex jigsaw. 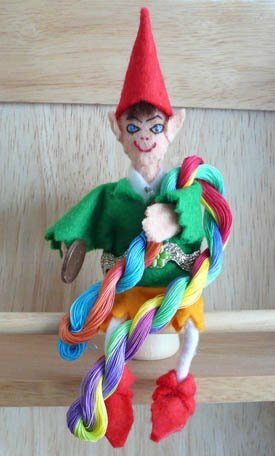 I know that I can make any one of them again, how much thread they will take and about how much time. What book will I do next??? Well my bookshelf is overflowing with tatting books. Some I have made quite a few patterns from, some none at all. Some are new and still being flipped through. Some are not suitable for this as the patterns are so varied. I like to do ones with a theme. All are shouting....ME, ME, ME!!!! All in good time I will make my way through another one as the feeling of satisfaction is terrific. But just not yet. You may not hear from me for a long time!!!! Yeah! this is the penultimate heart!! from Martha's book Tats Amore. This is another practice for the biggie to come and I really did need some practice! This heart is quite a big jump from the teeny one I showed yesterday but if you think this looks complicated...wait til you see the final one tomorrow..now that really is complicated. 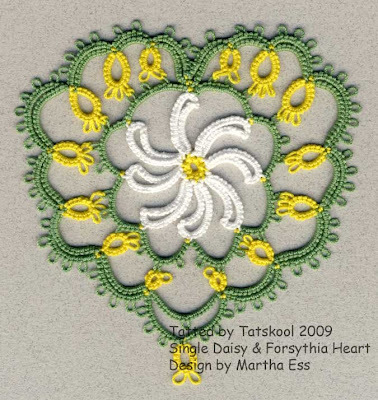 This one is called Single Daisy and Forsythia Heart and it is exactly that. The forsythia flowers I have made in the last heart. 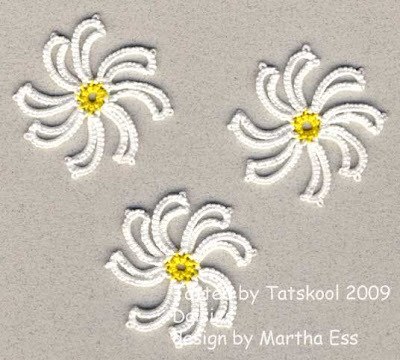 I have made daisies before a la Martha but never like this. These ones are made of folded rings....don't worry it's all explained perfectly in the book. I did lots of practice making these and trying to get magic threads in there so there are no nasty ends to deal with..that is tie a knot and glue between the 2 parts of the knot and hope it won't show. I am useless at sewing in ends no matter how hard I try! Mission accomplished so lets make lots of daisies as you never know when a daisy might be needed...like for instance in the final heart!! These are my 3 left over daisies ready and waiting to be part of the biggie tomorrow! but doesn't it just cry out for some beads!! Oh you really can't see how those beads sparkle...silver lined light green so it's down to the camera to try to show you. The beads in the centre are my favorite opaque yellow. Nope this doesn't really show the sparkle either. 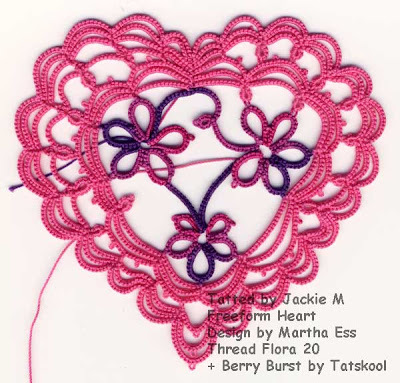 This heart was made in Size 20 Flora and measured 8cm. I am getting to the end of my heart marathon...only 3 more to go...but will I last the pace!!! 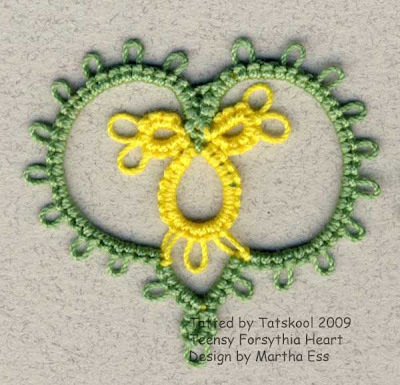 Today's heart in the Teensy Forsythia Heart. Martha is good at dreaming up flowers that I have never seen tatted before and Forsythia is one of them. This little heart is so sweet that there is no need to try and fancy it up at all. It is complete just as itself! 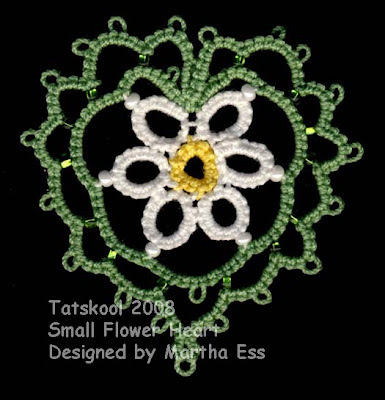 I get asked often what I do with my tatting and the answer is usually NOTHING! I am, therefore I tat!! Tatting to me is like mountain climbing to a climber, the challenge is there, so I try to achieve it in the best way possible. I don't often have actual duplicates because I can always see another colour it could be made in, and then I want to keep them all! So if I want to give something away to someone who will actually appreciate it, I do actually have to make a duplicate!! 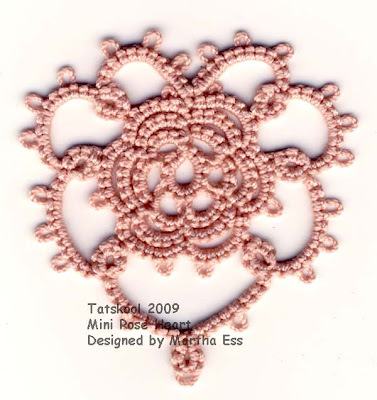 My tatting mostly lives in a folder along with the pattern ready for when I want to make it again or show it. I am trying to make more display boards to have on show as that is my favorite way of displaying. Just a few tats are in photo frames. But don't think that just because it lives in a folder that I don't look at it and marvel at it all over again. 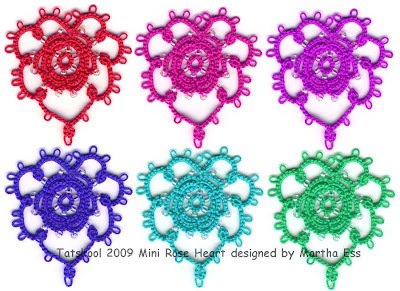 Because tatting is marvellous. This little heart took 92cm of yellow and 1.25m of green in size 20 Flora, and measures just 3cm. No 15 Freeform Heart is the ultimate freeform unsymetrical heart! and I love it. It has such crisp, sharp, clean lines with good negative spaces. It is an elegant vision of assymmetry!!! 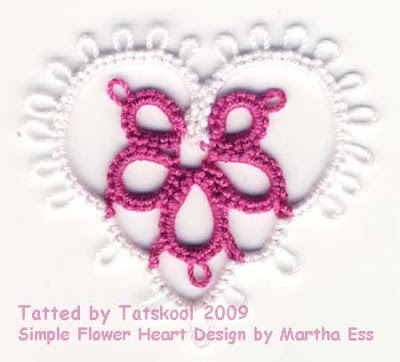 Martha says that she was inspired by Mary Konior's Random tatting technique... Martha you have cracked it too! Did you gather that I like this one...I didn't think that I was going to!! because I am at heart a symmetrist. Here is my trial piece in a mid pink flora 20. 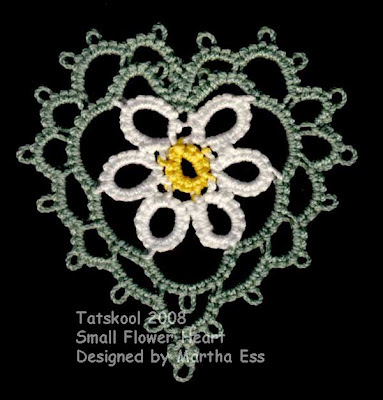 At the centre of the heart is a beautiful piece of floral tatting design. It is so pretty that at first I thought that the outline might swamp it. The outline itself rows of rings and chains is outrageous in it's own assymetry. Take a close look. It is quite difficult to keep the inner rows of chains tight against each other to give a neat effect. Of course the next obvious thing to do is to tat the flower motif in HDT. I chose Yarnplayers Roses and it was beautiful. The outline I did in a deep fuchsia colour Flora 20. 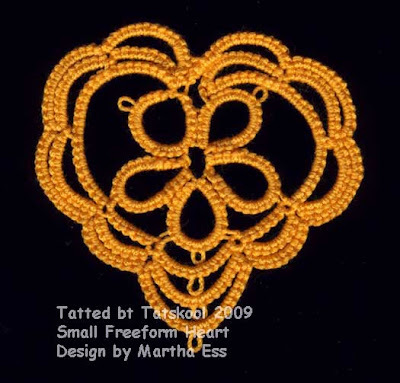 A lovely piece of tatting, see how she managed to get a perfect straight line at the top of the heart where the rows of chains start and finish. and that inspired another friend Carmel to do the same and tat a dark blue outline...not finished yet tho'. Oh the lovely colour combinations I could tat this one in. Size 20...Sh1, 2m, Sh2, 3m. 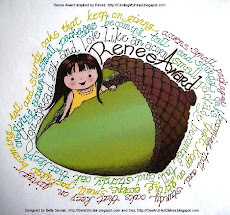 This heart called Small Freeform Heart builds upon my experience with the last one. If you are happy making that one then this one is a doddle too. The center is the same 5 petal daisy as before but the outline is built up of rows of chains, making this one so much prettier in my opinion. First try was in my favorite orange Flora 20.....pretty good apart from making a mess of the final join at the top of the heart!! I really like the way the picots at the bottom of the chains line up. Blocking is very important in this pattern as in most of the heart patterns. Getting a balanced shape makes all the difference. 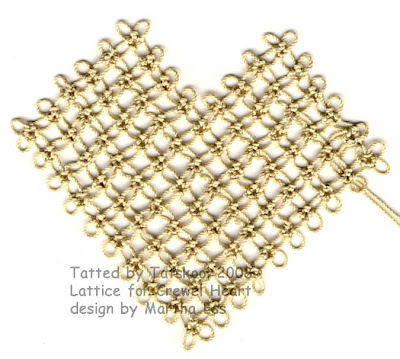 It is very important while tatting to try to get the lengths of the chains equal on the two sides. Second one is in one of my favorite Flora pinks also size 20......I was fascinated by the fact that most of the commenters on my last heart liked the blue one. Because that one was in size 10 to me it looks 'clunky' and that makes me see how on the blog difference in thread size is eliminated when blogger shows them filling the allowed space. With this pink one I tried adding beads, my favorite Rainbow Ruby, and absolutely loved the result. This is one of the prettiest small hearts in the book, a lovely clear crisp outline, very classy. This theme is building up to what became my favorite pattern. I hope you will come back tomorrow to see it. Size 20 Flora....Sh, 2.55m. Ball/sh2, 2.40...making a total of about 5 metres. The central flower on it's own took about 1m. On to a different family of hearts today that are going to prove to be anything but symmetrical. 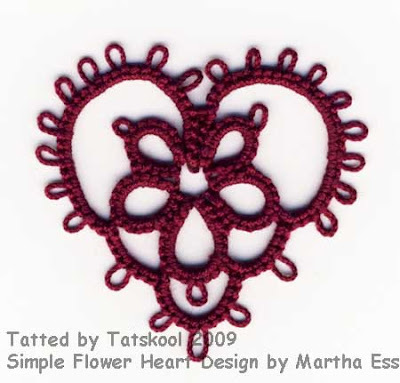 Today's one is the easiest, the Simple Flower Heart. Very easy and would look nice with beads. Size 10 Sh1, 1.5m, Sh2/ball, 1.5m... measures 5cm. Size 20 Sh1, 1.25m, Sh2/ball, 1.15m... measures 4cm. My thanks to everyone who is still with me and still leaving comments. This is the biggie. Martha called it Your Grape Big Heart...a great name I think. When I first got the book this was one of the ones that I really wanted to make, It looked stunning, but it did look a little daunting. Now that I have practised making grapes, at least I knew that the grape bit was not going to be at all difficult. It wasn't! 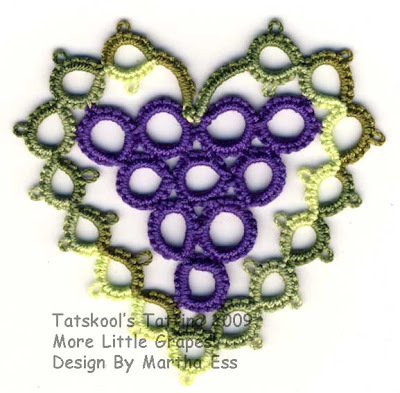 The next bit was to make the vine leaves at the top of the grape and this was a bit more challenging. Especially as the instructions are only written for one side.. You have to do the second side in reverse....mmmmm!! that bit I was not too keen on but I did it. At this stage it looked stunning on it's own. Feeling that putting the outline on might spoil it and not having time to do another just for this part...I scanned it. The thread is my favorite perle 8 Anchor by Coats Madura ( a lovely thread to use but not easy to unpick like all perles) and the green is one of my early dyeing experiments called Spring Greens made using Dylon Cold Dye. can't you just imagine this on a black T-shirt. The outline was easy to do, mostly split rings. my problem came from the size difference between the perle and my HDT so my heart outline bowed!! But with carefully blocking it finally gave in and flattened giving me a pretty effect with the top half bulging sideways slightly. The green is another of my HDT early trials, Woodland Greens. Vine leaves not too sure about this, think each side took Sh1, 1.75m. Sh2, 75cm. The Heart measures 10.5 cm. 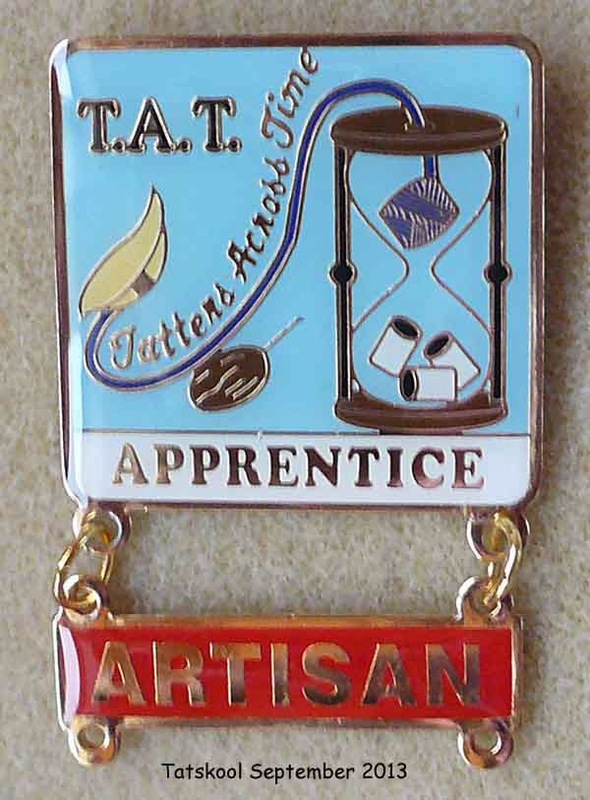 Now that you have practiced making six little grapes we can move on to something bigger...I hope that I have inspired at least one person to tat along with me!!! 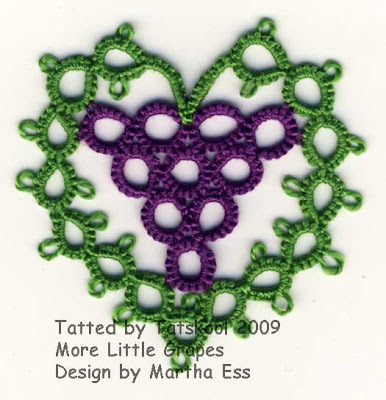 The next grape heart is called More Little Grapes, has 10 grapes and is surrounded by a split ring outline...easy peasy! Martha tatted hers in size 8 perle so I thought that I would try perle too. I thought this damson colour was a lovely colour for grapes, the house elf who knows about these things was not so sure tho'!! It's lovely and shiny but the thread is a bit too soft for me to use for big projects. This was one of those times when I thought the reverse looked better that the top side, more rounded and grape like. I toyed with the idea of using it as the top side but finally decided not to. Here is the reverse of the heart. Which side of the grapes do you like the best? Notice the way all the little specks of a different colour on the joins are on the reverse side. That is the difference that doing up or down joins in the appropriate place makes. Just a little bit of tatting finesse. Having just said that... I scanned in my next heart and prepared it for the blog and ooops suddenly noticed all the little specks of colour in the joins!!! Heck! 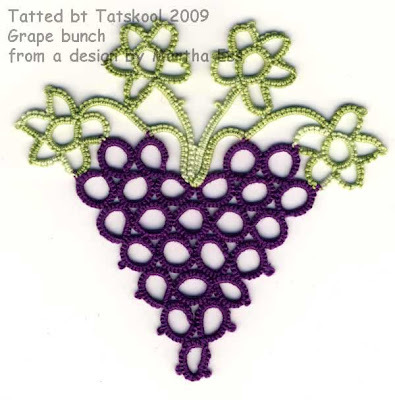 I said that was careless...then I suddenly realised that I had decided to use the reverse side of the grapes as the front...here it is ...so what do you think. 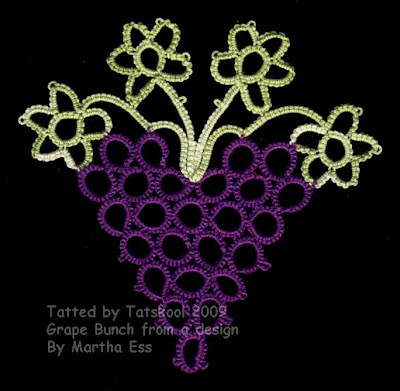 This one is tatted in Flora 10 with my favorite Flora varig' greens. Get practicing, tomorrow is the biggie! This is the last of the hearts that I made last year from Martha's book....( some of the ones shown here were made this year tho'). From now on they have all been made this year...and are still being made...hope I can finish them within my heart a day deadline. No 9 is the daddy/mummy of them all! Now that you have practiced the small lattice....do have a go it's not as hard as it looks and the results are worth the effort. You just need to get the picots/mock picots as even as possible to get an even trellis effect. This heart..just called Crewel Heart has a 10 x 10 lattice...with a chunk missing to give the heart shape. The outline uses the frilly outline of heart No 8 on one side and the plain..no picots outline on the other side...from Heart No 7. This is my first lattice in a Flora 20 thread trying to look like a linen fabric...nearest colour that I could find. It was this and the lattice that first attracted me to this heart of Martha's. One of the things that always bugs me is that Martha always chooses the perfect colour scheme and I want to make mine the same!!!! But there is no point in that or my hearts would have no personality of their own!! Sometimes it is so hard to force myself to pick a different colour scheme and this was one time. Martha's heart was in my favorite colour..blue. Oh My! don't those colours make each other zing. It's like they can't decide who is boss!! Not sure I really like it. So I tried another more harmonious colour combination. I am not yet happy with this one as one side dominates the other...and the frilly side it made in Altin Basak which is a slightly thinner thread...and is a bit too pale....but it will have to do! This was my first attempt at the lattice in silver...I thought "if Martha can do it then so can I!!!" 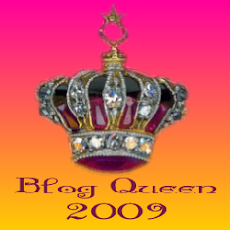 note pride often becomes before a fall...but you don't have to show it on your blog!!! but if you do it will show others that yes you do actually make mistakes just like they do!! so do give it a go! 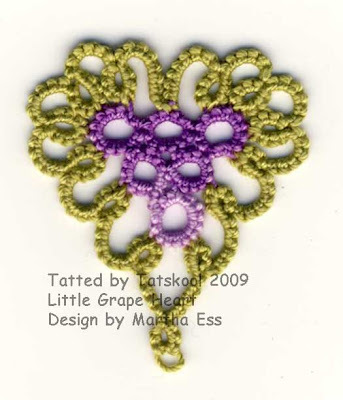 Martha also gives instructions for making two variations with the outline matching on boths sides, plain and frilly. But I haven't the energy to make them! her instructions and diagrams are superb. Plain outline took Sh 4.10 metres, ball 3.50 metres. Sh 2.25 metres and ball 5 metres. 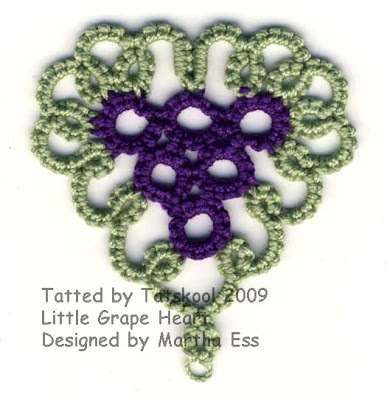 No 8 is a cousin of No 7 the Smallest Crewel Heart and goes by the name of One More Small Crewel Heart!! They are very close these two! This heart has exactly the same lattice centre so practice has paid off!! But this little madam likes the good life and the more frills the better for her! First one uses the Flora 20 variegated for the lattice and a mid pink flora for the frills. 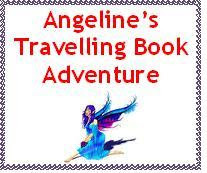 In her full party clothes in paler pink with with her silver lattice, isn't she a beauty? Aren't the crossed picots very effective? Frills.. Sh1, 1.0 meters. Sh2, 3.5 meters, the small picots all measured with a gauge are 6mm and the crossed picots are 17mm. the finished heart measures 5.5cm. 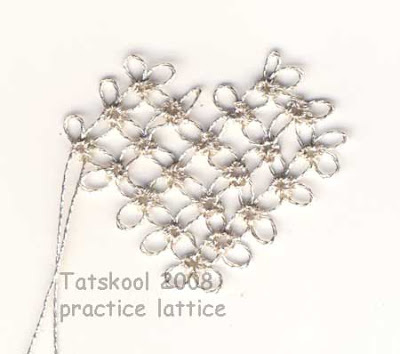 Which lattice effect do you like the best, sparkly silver or neater, more square cotton thread? Gosh it's getting hard to keep up posting a heart a day, even when I already had a lot finished. 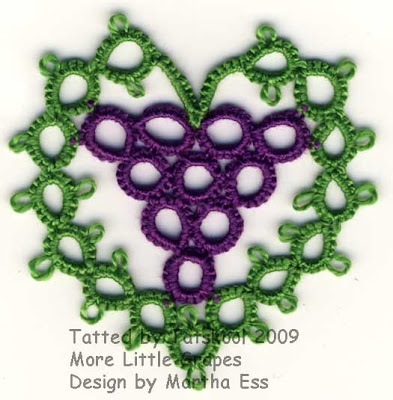 Today's heart is another small one, a practice for something bigger, tho' it wasn't a practice piece for me as I was thrown in at the deep end test tatting the biggie for Martha, and it was only afterwards that I got to see and tat the smaller ones. She gave me a choice and I chose the most difficult one...was that a big mistake or just a challenge. 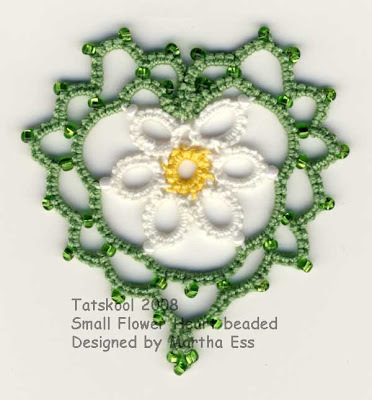 Martha says that the central lattice is based on the texture of crewel embroidery. It's quite difficult to get this lattice looking good and even and I recommend doing several practice pieces. You need to get the lengths of thread (picots and mock picots) between the rings the same length. I used a gauge 7mm for the picots but found it better to eyeball the mock picots as it was very difficult with the gauge. 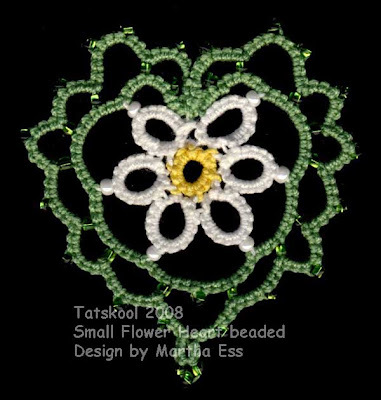 The lattice on this one was made with a variegated flora 20 but I was inspired by the silver lattice on Martha's examples. This you really do need to practice as the silver thread refuses to lie flat. Here is a practice lattice. You can see how the springyness of the lattice makes it difficult to block. Oops looking at this more closely, I see LOTS of mistakes in there, maybe that's why I didn't show this one before, have to admit it looks most original tho'!!! This one looks much better...just like it should look! I think I should be satisfied with this!! The silver thread that is my favorite to use is Coats Ophir. The heart measures about 5cm. The result is well worth the effort and becomes a lot easier with practice. 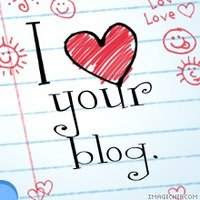 Thanks for your comments have you put yourselves down as followers of my blog, I only recently realised how much fun it was to see who was really interested in my blog. All comments and followers are most welcome. 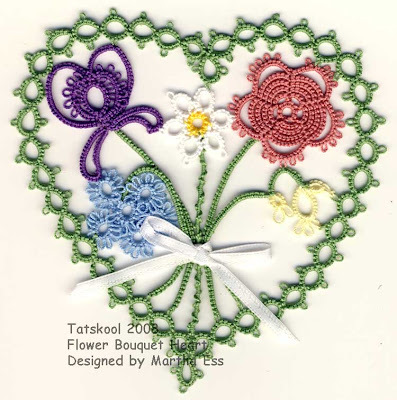 This is another small heart, to team up with the large flower bouquet heart. 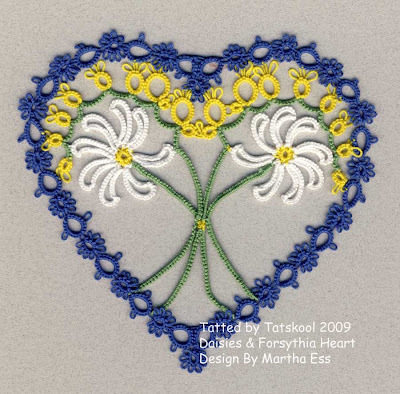 Once you have made the white daisy in the center....great practice for making the large heart if you find that daunting.The daisy is made in exactly the same way, it's just a tad bigger. After that the two rows of chains are a doddle. Result very pretty and very satisfying. 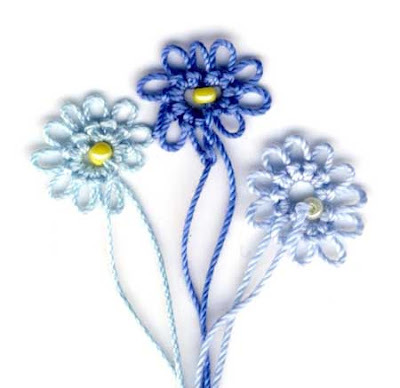 Thread amounts, Size 20 Flora Daisy centre 40cm on shuttle, petals, 1.25metres on shuttle. Outline Sh1, 75cm, ball/Sh2, 1 meter. I have been following the order of the designs in the book...so far...but I am going to have to skip ahead as I haven't finished the next one!! Thanks for the nice comments, please keep them coming as bloggers (well me anyway) need to know that they are doing something useful and should keep it coming. 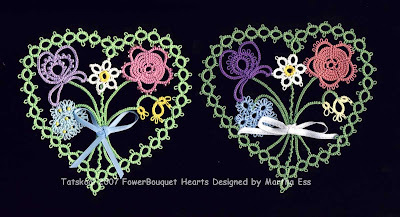 Today's featured heart is the Flower Bouquet Heart...you have seen this before last year as it was one that I test tatted for Martha. This was my first attempt... a Summer bouquet of flowers. 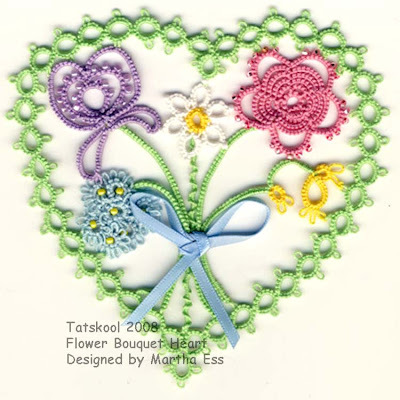 This was so beautiful that it inspired another, this time a lighter Spring Bouquet with lots of beads. One of these days!! I will do an Autumn Heart version..just don't hold your breath!! Now what can I say about this pattern....what can I remember about it! Lots and lots of different techniques to practice. The outline is worked first and is easy. In size 20 Flora I used Sh1 4.25 metres, Sh 2 3.25 metres. The flowers are then made and joined onto the outline as you go...a bit fiddly but worth the effort and nothing difficult. The White and Yellow Daisy took, 40cm for the centre and 1.25 metres for the petals. The Iris uses a nice little technique of folded rings which is easy enough and took 1.25 metres on Sh1 and 1.25 metres on the ball/Sh2. The Rose took Sh1, 1 metre and 2.10 metres on the ball/Sh2. Little Blue Flowers took 2.5 meters on the shuttle. The stems are added individually. Each stem used about 25cm on the shuttle and 1 meter on the ball. Finally the Yellow flowers, they took Sh1 yellow thread 1.5 metres, Sh 2 Green thread 1.25 metres. It looks and sounds very complicated but the diagrams are so good that it's easy to follow. The pattern covers a full 3 pages!! 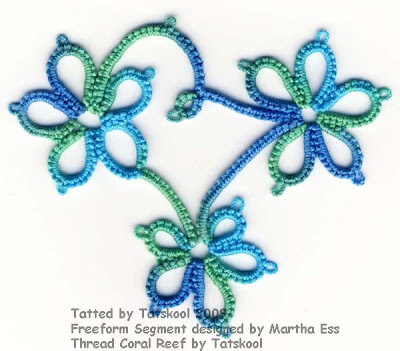 The little blue flowers with the beaded center...here are some of my trials.. I have forgotten how I did them but I think it was a form of Jane Eb's way of adding beads to the center of the rings in Pamela's gecko pattern. I used magic threads in every single part of this heart...quite a feat! One last scan, new for this year, both hearts on my favorite black background. HAPPY VALENTINE"S DAY everyone!! Hearts rule today! 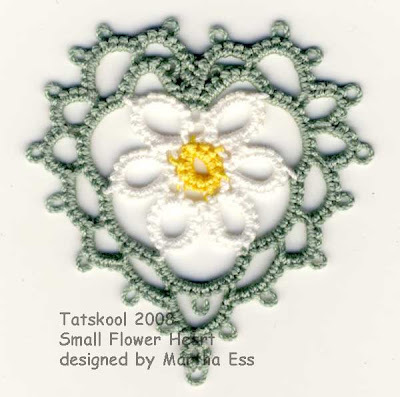 Today's heart is another small one, a compliment to the Antique Rose Heart of yesterday, It's name is Mini Rose Heart. 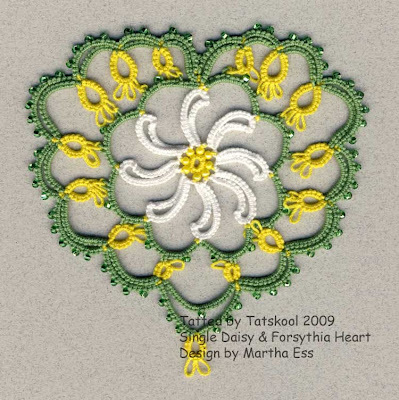 It's good practice for anyone who hasn't tried making the Rose motif found in many patterns. Very easy to make, just lock joins into lock joins and good tension. Practice version is in the same dull pinkish thread as before in size 10 Flora. Now for a fancier version in my favorite deep pink Flora 20 with beads added to the picots as well as some from Sh2/ball thread. You all enjoyed seeing the possible colours of the Tiny Scallop Heart so let's try it again with is one. The deeper pink colour enables me to get more jewel like colours this time. Aren't they just gorgeous? Lots of potential for this design. Size 10 Flora Sh1 1.4 metres, Sh2 or ball 2.75 metres. Heart measures 6cm. Size 20 Flora Sh1 1.2 metres, Sh2 or ball 2.25 metres. Heart measures 4cm.